On small islands with limited land mass and a whole lot of people – Malta has the highest population density in the EU – managing waste is always a proverbial issue and a contentious topic. Malta is still among top rubbish producers in the EU. Although investment in the past decade has helped reduce some of the worst of the landfill volumes, Malta still has a low percentage of waste recycled compared with EU counterparts. We’ve seen Malta’s infamous waste mountain – Magħtab – closed on EU accession and being re-purposed, but our rubbish mountains won’t go away without a whole lot more re-purposing. Any initiative that can reduce our individual household waste is to be lauded. It was the notion that one man’s waste is another man’s useful item that prompted Maroushka Zammit to start Recyle Malta as a humble Facebook page encouraging friends to post up used items they were seeking or seeking to dispose of. Her voluntary initiative grew fast, exploding overnight with listings. We find out from Maroushka how and why it works, how she manages a now very busy full-blown Recyle Malta website, and discover some truly weird items on its listings pages. The organisation is now running its first Crafts/DIY Competition to promote creative recycling. Recycle Malta was born just last summer, starting online on Facebook. What motivated you to start it? Back in May 2012, I started to notice quite a few requests pop up on my Facebook newsfeed for various domestic appliances posted via personal profiles. I thought it would be a good idea to create a group where people who were in need of an item could connect with those who wanted to get rid of something, all free of charge. I wasn’t sure it would work but within hours of creating the group I got a message from a local radio station asking if I would give an interview about the initiative. Within days the group was into the hundreds and it hit the ground running! Explain in brief how it works. If you have an item at home you no longer use or need and want to get rid of, instead of throwing it out you can post it on the group wall, no matter what condition it is in, as long as you are honest about that. Likewise, if you have a need for anything you can make a ‘wanted’ request. It is a free to collector site, which means that the person interested in the item goes to collect it themselves or arranges payment for its collection. We are not item specific so it really can be anything that’s posted up; we’ve had entire kitchens and bedrooms go! The initiative picked up momentum so fast that you grew quickly from Facebook group to a very organised and professional website with listings. How have you managed to fund and run it? I run Recycle Malta on a voluntary basis with the help of two friends, Becky and Nathalie, who help me monitor the Group on Facebook. As for the website, that was created freely – time which was kindly donated by our webmaster. Of course, there was and continues to be web management time required by the webmaster and myself and the initial cost of starting the website I covered. I don’t make any personal gain out of running the initiative, other than enjoyment and personal satisfaction! Since it is not a paid job, I don’t have fixed hours. I do spend a lot of time on it and at strange hours too. I particularly enjoy the creative aspect of recycling idea sharing. I’m in my element with that as I grew up in that kind of environment. The most common request is probably children’s items and clothes since they quickly grow out of those. The most unusual was probably garden soil and cow’s urine! We are still waiting for someone to donate the urine though, we need more farmers to join! Mobile phones, corks, furniture anything goes and goes quickly most of the time. At Recycle Malta, you’re very keen to see people ‘upcycle’ goods. Give us some examples you’ve come across of creative upcycling in action. We keep our Group for just wanted and available items but through our admin profile on Facebook we regularly share recycling/upcycling ideas with one another to inspire people to creatively reuse/re-purpose what they have and extend its life that way. Some great local shares (we have a growing international following too) have been cushion covers made from old T-shirts, a mosaic artwork made from old tiles and mug pieces, and then set in a frame picked up from a skip; and soft toys made from old children’s socks. There are plenty of ideas to choose from both decorative and functional ones like the oven guard made from reused cardboard or the bed sawed in half and converted into a dog’s bed. 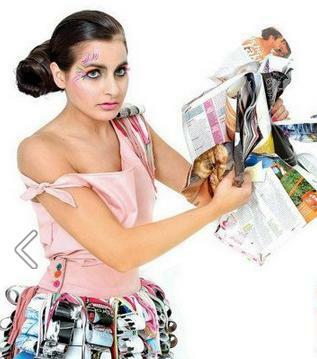 Tell us about your first recycle-upcycling competition? What is its aim and how can we participate? At the moment we are running our first ever Recycled Crafts/DIY competition on Facebook. We’ve launched our album with 19 participants and some great entries and prizes to be won. 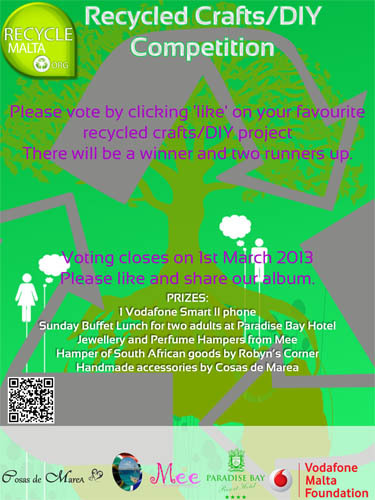 Voting is open until 1st March. The aim is not only to encourage recycling but the creative reuse of items. For those who would like to check it out and vote, they can look for us on Facebook under ‘Recycle Malta’ and see the photos there. Where do you see the Recycle Malta project going next? I’m really pleased to see that the concept has been grasped and is being enjoyed by those who have joined us. We are doing ourselves and the environment a great service by appreciating what we have, learning new ways to reuse our items and if we really have no place or purpose for an item then to pass it on to someone else who may. I hope to have more competitions – especially themed ones and hope to do more researching and sharing to educate ourselves and perhaps some interesting collaborations on events with likeminded folks. Believe it or not, I run Recycle Malta on my own from the UK, where I live and work. Thanks to the group, I am in Malta ‘virtually’ every day. I would like to thank all who have joined us and contributed in some way. Long may it continue. Previous Post Why Learn English in Malta?